You need to target all three parts of the deltoid. Strong shoulders make it easier to do basic, everyday motions like lifting, carrying, pushing, and pulling. But the deltoid is a three-headed muscle with anterior, medial, and posterior parts, and not all moves work all sections. Overhead presses, for example, engage the anterior deltoids but barely activate the posterior. For balanced strength, include the below trio in your routine. Each exercise focuses on a different area. 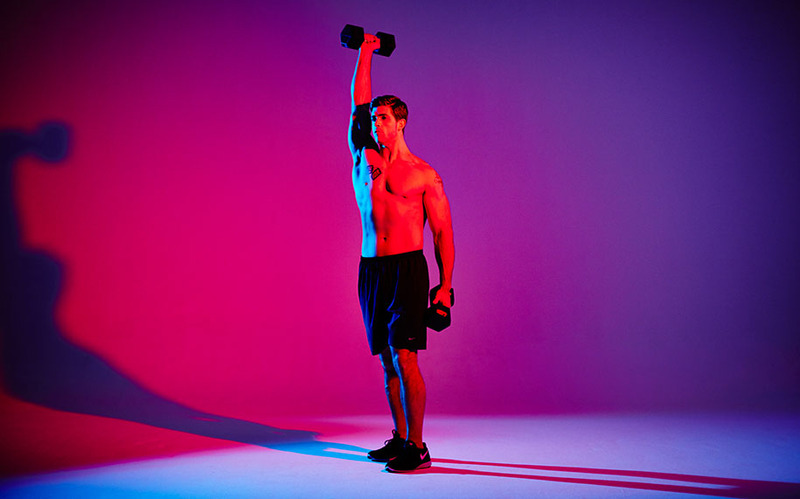 How to do it:Hold a dumbbell in each hand, arms at sides, hands at hip-height, palms facing each other. Simultaneously lift both arms out to the sides to shoulder-height, so that your body forms a T. Return to start and repeat. How to do it:Stand facing a cable column (or a resistance band) anchored at shoulder-height. Hold the handle with right hand and extend right arm to shoulder-height in front of you, palm facing left. Bend right elbow, pulling handle to the outside of your chest; return to the starting position. Do all reps on this side, then repeat on the other. How to do it:Hold a dumbbell in each hand, left arm at side, and right elbow bent with weight in front of shoulder and palm facing left. Extend right arm overhead so that elbow is extended. Slowly reverse motion to return to start. Do all reps on this side, then repeat on the other.